To get started with KDE development, newcomers usually first sent patches. Having sent several patches, the newcomers are typically encouraged by us (the reviewers) to apply for a KDE contributor account. This application includes the question of “who encouraged you to apply for a KDE contributor account”. Then, the KDE sysadmins contact the mentioned developers to make sure the application is valid and trustworthy. Hence, you, as someone who encouraged others to apply for an account, get a mail with the subject “Developer account application approval […]”. For each contributor, get the contributors commit name (you can look this up on identity.kde.org > Prople. Check, whether the new contributor added him/herself to the relicensecheck.pl script. If not, please send this contributor a mail and encourage him/her to add him/herself to this script. You really should check this, since you are also responsible for getting these new contributors commit access. I did that with 8 contributors. 7 already added themselves within one week. Only one is not reachable by mail anymore… So it seems to work quite well. At this year’s KDE conference Akademy, I was working on a small plasmoid to continuously track the disk quota. The disk quota is usually used in enterprise installations where network shares are mounted locally. Typically, sysadmins want to avoid that users copy lots of data into their folders, and therefor set quotas (the quota limit has nothing to do with the physical size of a partition). Typically, once a user gets over the hard limit of the quota, the account is blocked and the user cannot login anymore. This happens from time to time, since the users are not really aware of the current quota limit and the already used disk space. Clicking on a quota entry will launch Filelight in the correct folder, if it is installed. 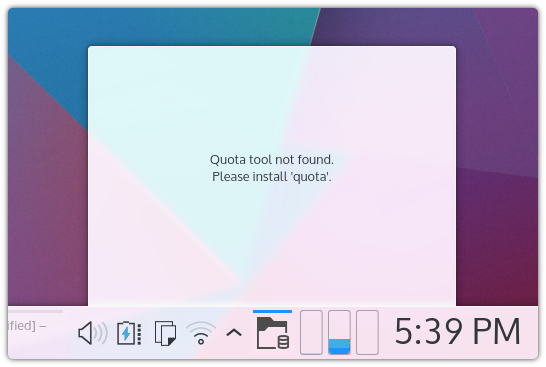 Finally, if the quota is >= 98%, the quota icon pulses to get the user’s attention (a nice Plasma 5 feature!). To decrease the quota again, simply click on the respective quota entry in the list view. This launches Filelight with the correct location. Since Disk Quota uses the command line tool ‘quota’ and launches ‘filelight’ when clicking on quota entries, you should ship ‘quota’ and ‘filelight’ when installing this applet. Most certainly, this plasmoid is only useful for networked systems (with remote mount points) and enterprise installations.